It was a pleasure to meet Bod and Valerie in the bar of the Kintail Lodge Hotel the previous evening. It obviously happens to them a lot, but they were recognised by me because of their dog, Ritchie! We had discussed plans for the following day. In my continuing pursuit of Munro Tops, I had a few to choose from in the area, including one way to the north of Sail Chaorainn. This was also a group of hills that Bod and Valerie had their eyes on. The forecast was set fair according to MWIS. 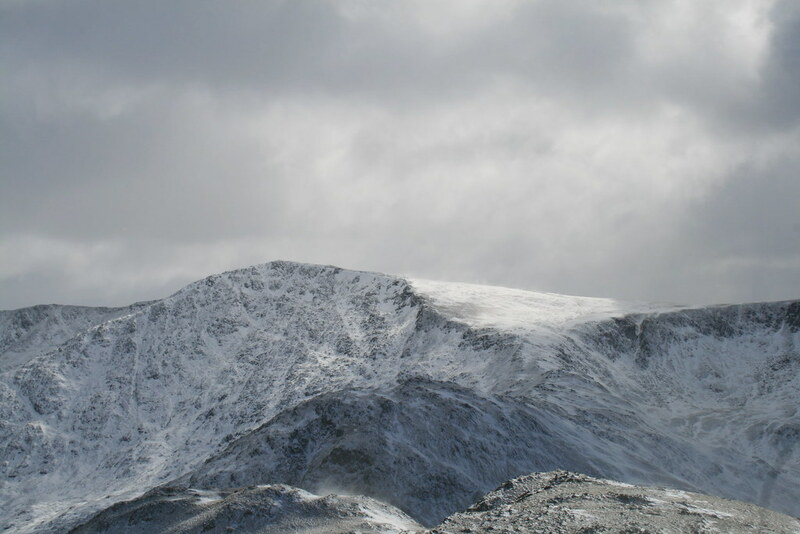 The morning was overcast but the clouds were above the summits. 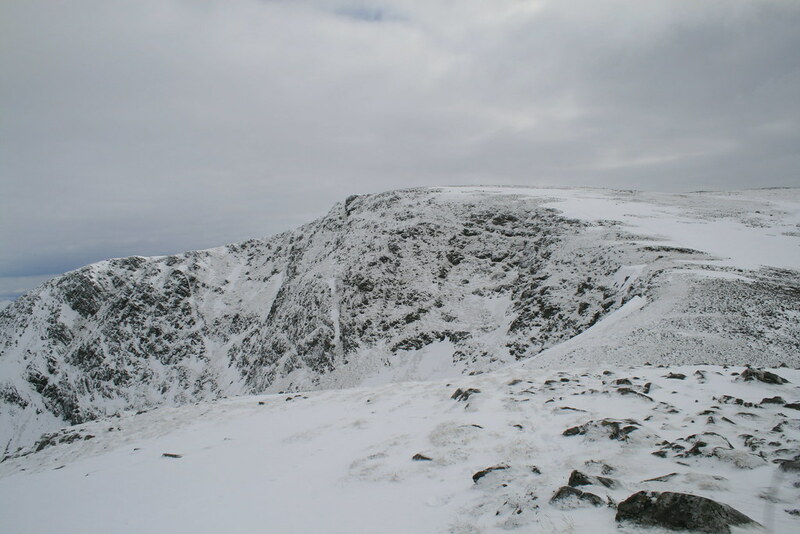 Essentially this route is the WH route with two extra Munro Tops added. So I will not describe the route in any detail. 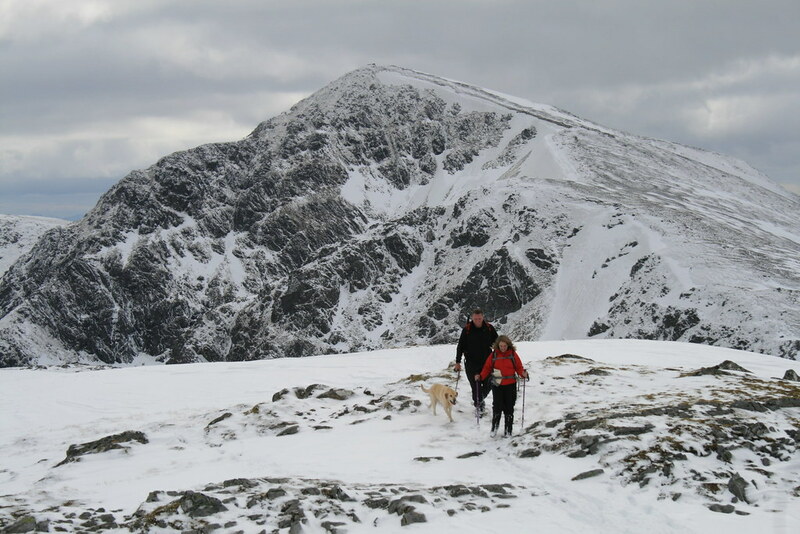 I set off before Bod and Valerie (and Ritchie) in the hope (vain as it turned out) that I might be able to do the Tops to the north in time to meet or catch up with them on the return. I left my car at 10.15am and followed the old military road. I was intrigued to know why these reflectors were needed in this location (useful when returning from the hills in the dark I suppose). 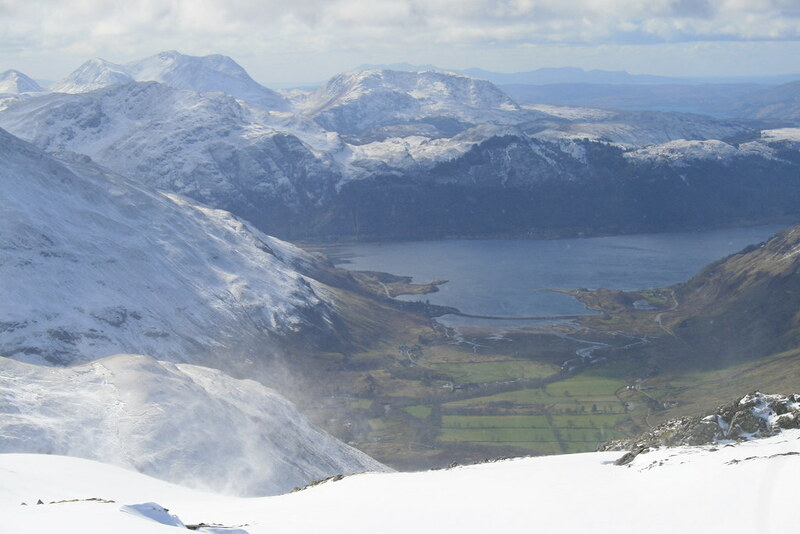 There were early views of the east end of the South Kintail ridge. But the light was flat under the steel grey skies. 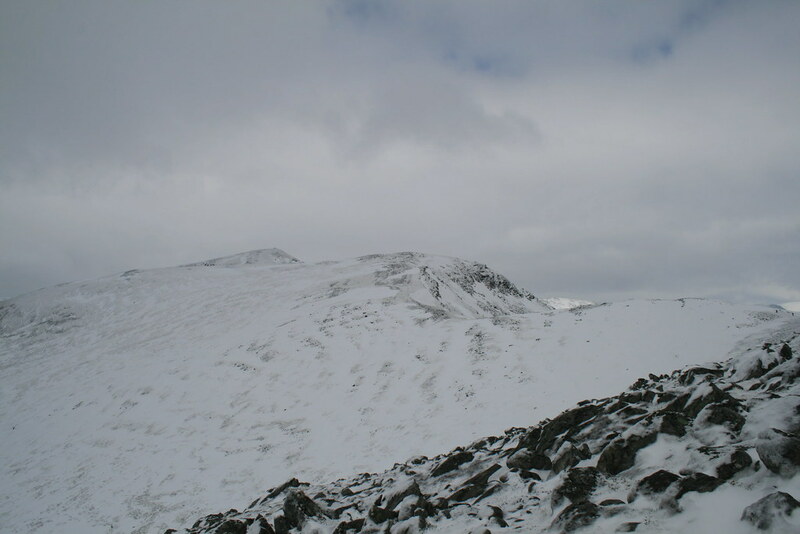 The track was lost under the snow on the more level section before the steeper rise on to the Carn Ghluasaid plateau. So I followed footprints which swing to the east a bit and up a bit of a ridge line picking the path up again around the 700m mark. 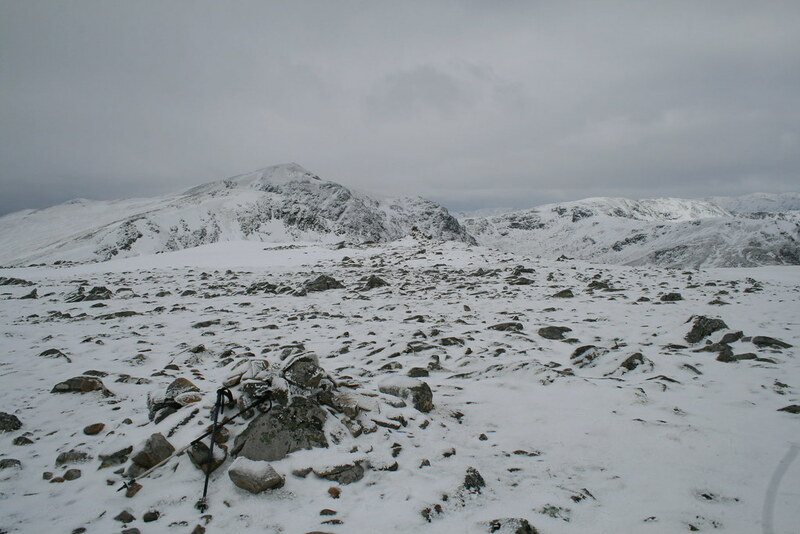 Here the plateau was windswept and so there was no major accumulation of snow. 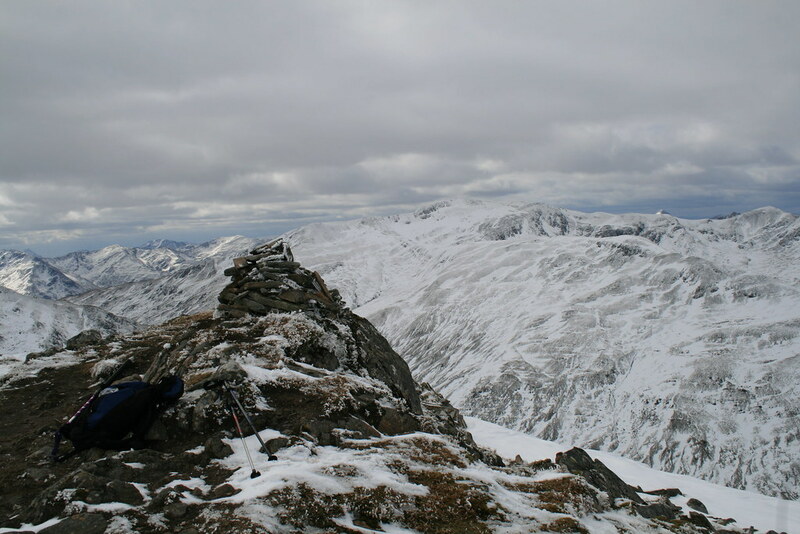 There were views to the linking ridge to Sgurr nan Conbhairean. Soon the top was reached. The WH route description suggests that this is a cairn on the cliff edge. An old SMC guide I have suggests it is at a cairn 50m back. It is all fairly flat up there. I went to both. Just over two hours to the top. 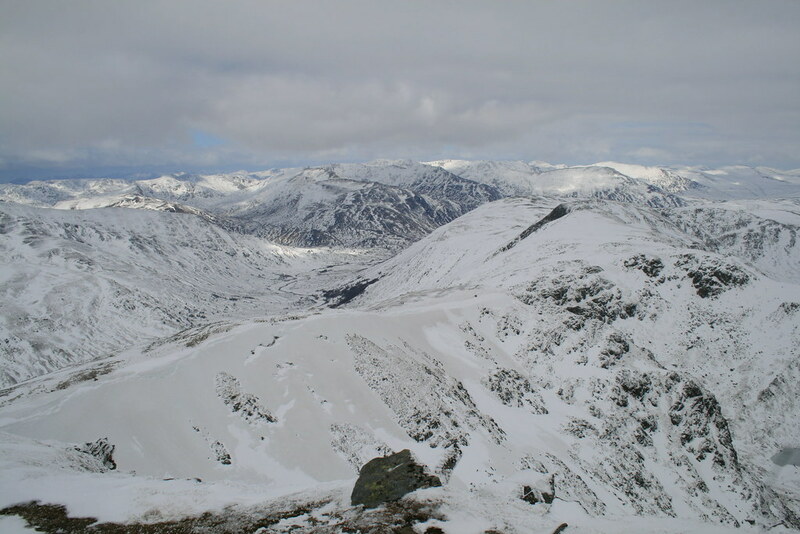 On to Creag a’Chaorainn and some deeper patches of snow but these were on downhill sections. 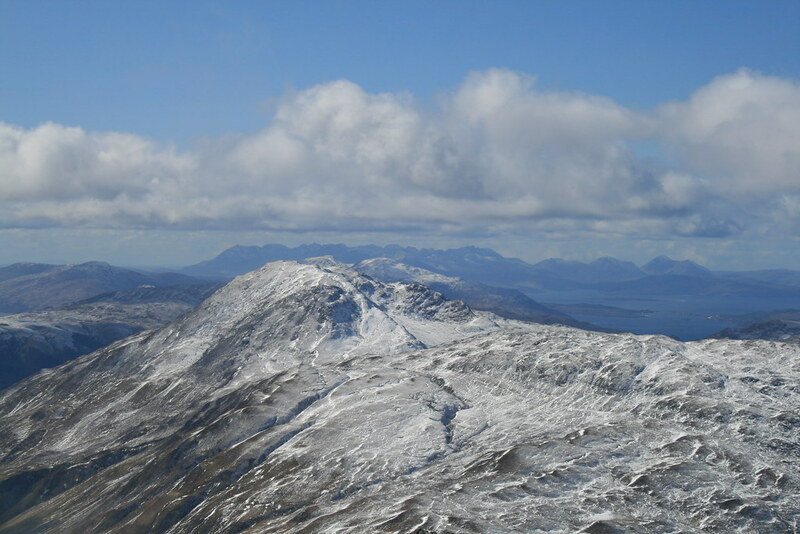 And A’Chralaig is in view. 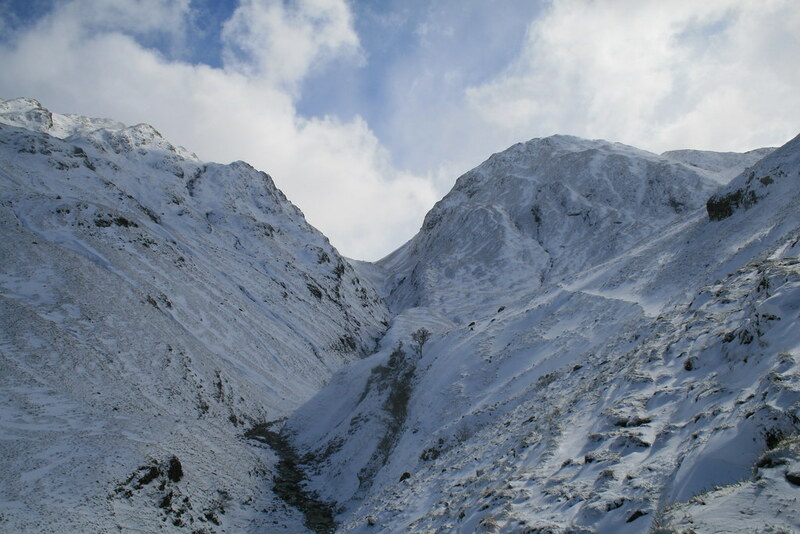 A shallow dip is followed by the final 150m climb to the crowning peak of the day, Sgurr nan Conbhairean. 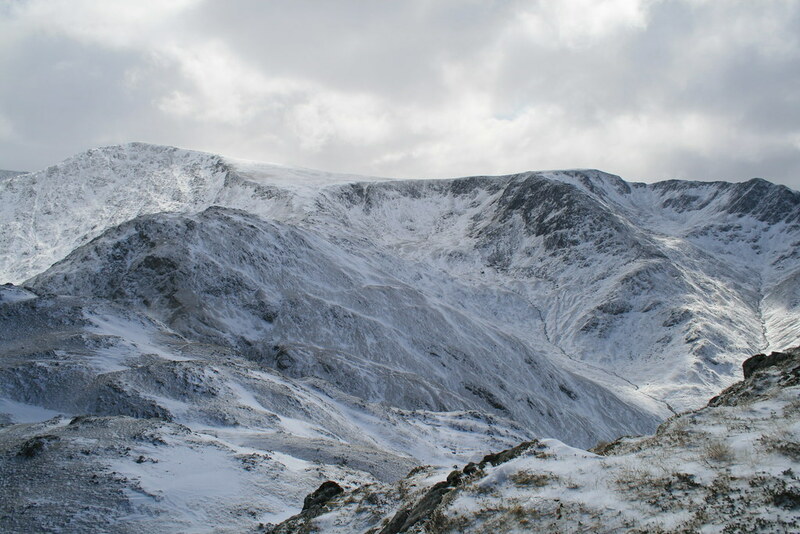 Carn Ghluasaid looks small. That leg has taken an hour and 20 minutes. The cloud shows signs of breaking. Distant Sgurr Fhuaran catches some sun. After 10 minutes on the summit I descend this way. 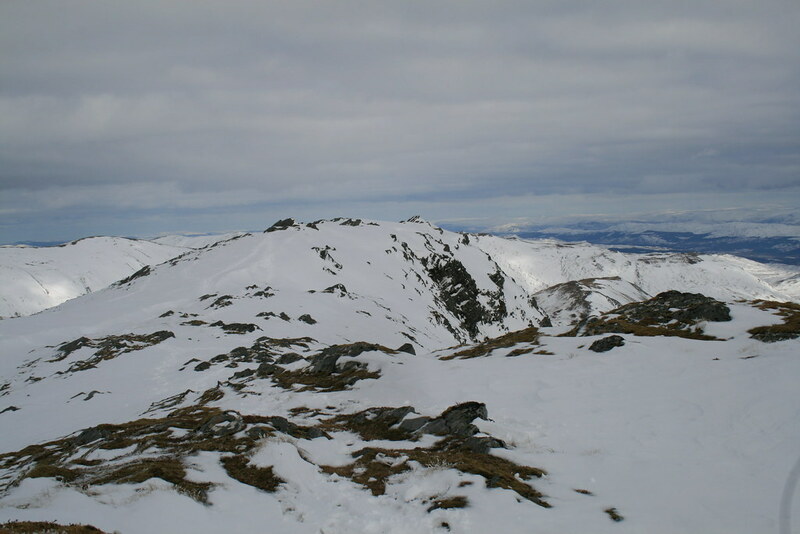 Down to the col in 15 minutes and a view back up to Sgurr nan Conbhairean. Here trouble starts. 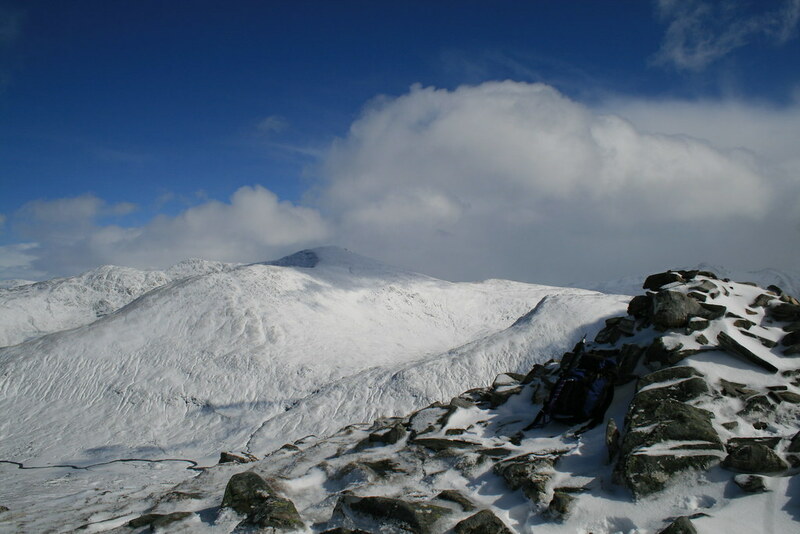 It is just over half a kilometre to the summit of Sail Chaorainn from here. 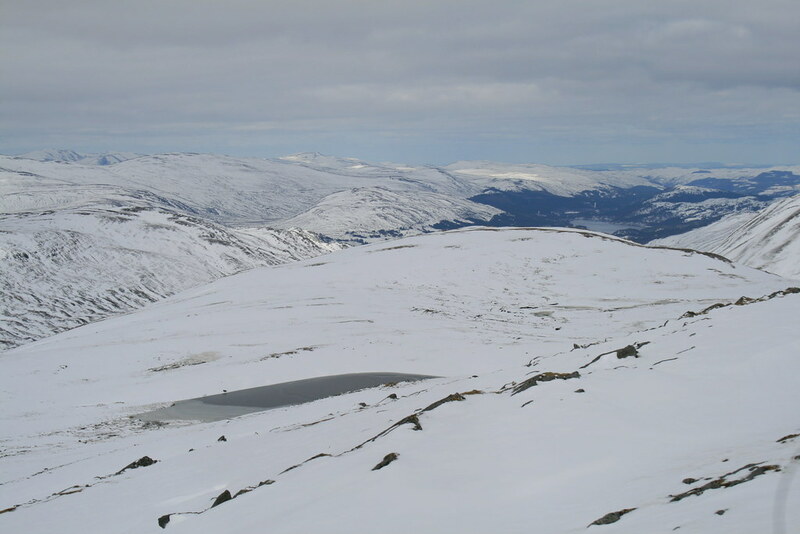 Just over half a kilometre of knee/thigh deep snow. Even with the benefit of the footsteps of those who have passed before what should have been 30 minutes summit to summit becomes a slog of an hour. I arrive at Sail Chaorainn around 2.40pm. I wonder about the wisdom of continuing further north. I had not checked the time of sunset. 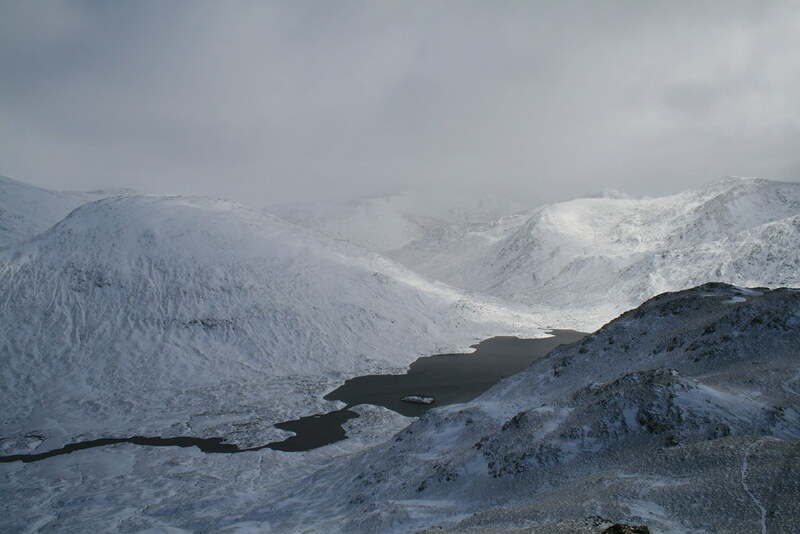 If the snow conditions were to continue as they had been I was uncertain as to whether I had the strength to do a 4 kilometre round trip followed by the necessary ascent or partial ascent of Sgurr nan Conbhairean. I dally for 20 minutes drinking and eating and taking in the views too. And then Bod, Valerie and Ritchie arrive. We have a natter. Further photos are taken and I convince myself that, having come so far, I must continue. 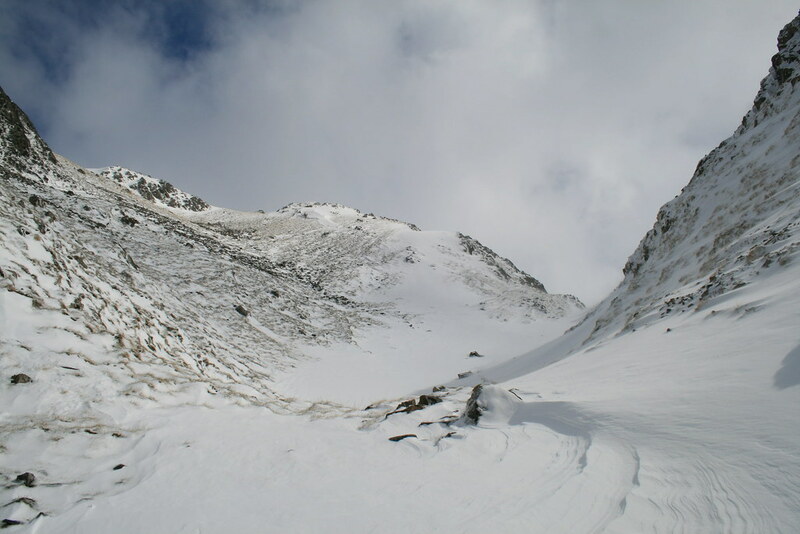 There is a deep notch between Sail Chaorainn and Carn na Coire Mheadhoin but the way is clear and the deep snow is more patchy. In 10 minutes I am on the next summit. It has a well built cairn. 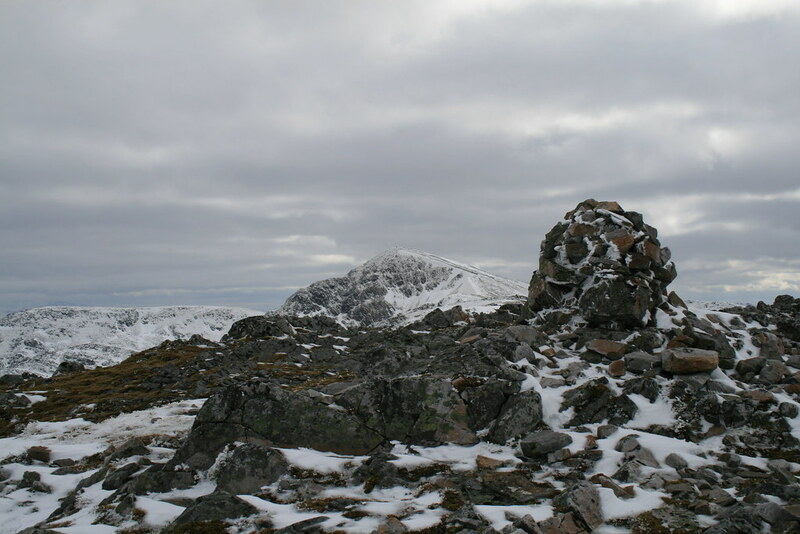 The final summit, Tigh Mor na Seilge, is a 100m drop and a 30m climb away – to be reversed on the way back. 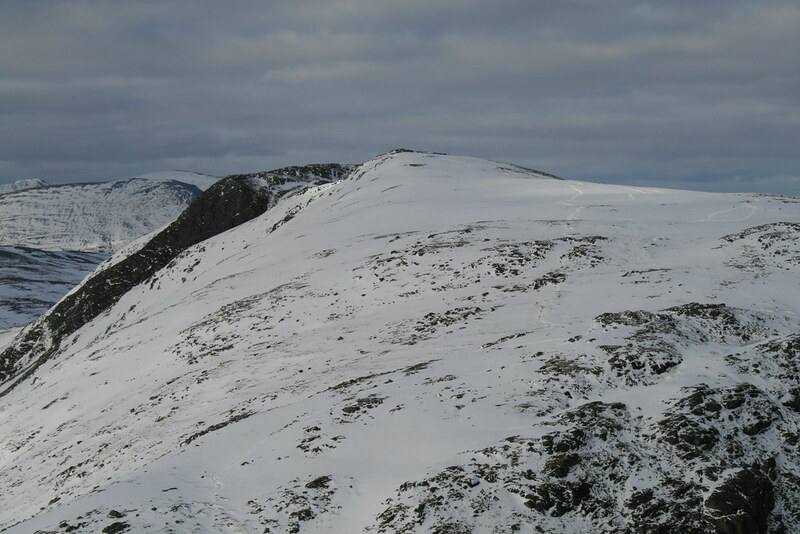 The ridge line of Tigh Mor na Seilge is covered in the deep stuff. It takes 45 minutes to get to the top. It is 4.10pm when I start the long journey back. The round trip from Sail Chaorainn has taken the best part of two hours. 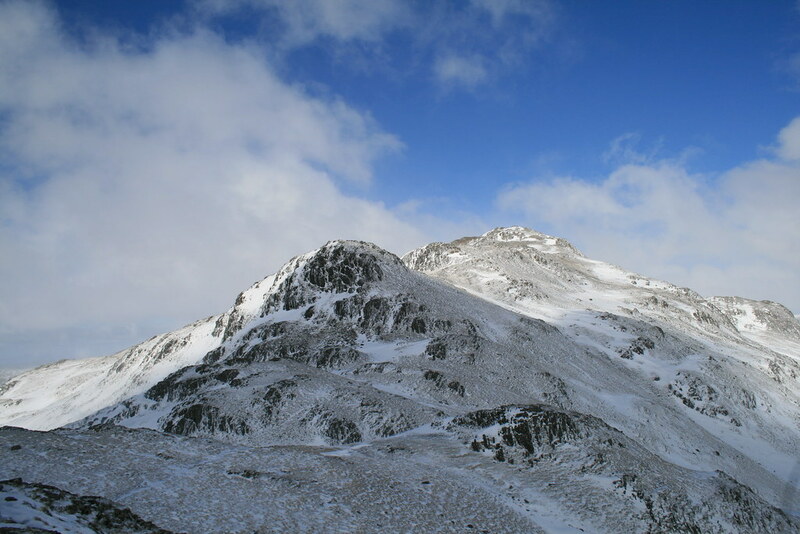 At 5.30pm I am starting the haul up Sgurr nan Conbhairean. I look back at the trenches created by the passage of feet across the gentle slopes of Sail Chaorainn. 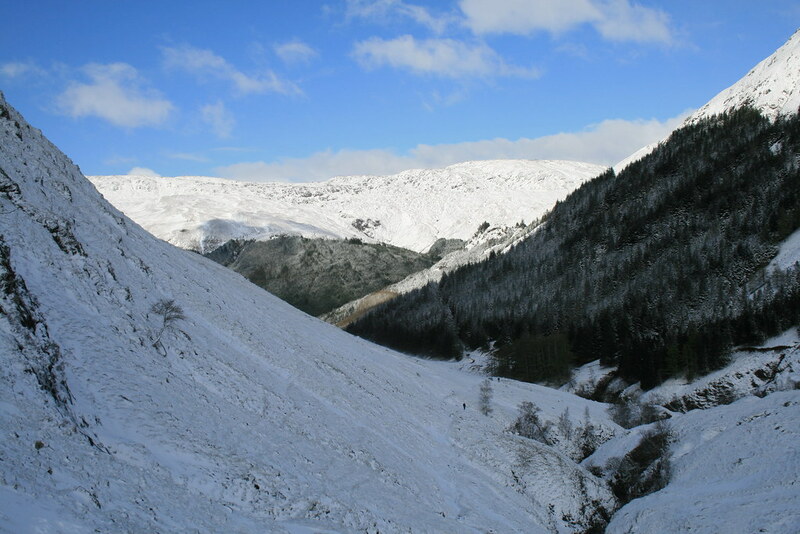 On the way back across those slopes, like others, I had swung around to the east where there was less snow. This had sped up the return considerably. The true summit of Sgurr nan Conbhairean is traversed to the west and I join the line of footprints descending towards the golden sunset. Behind me Sgurr nan Conbhairean is lit up with a backdrop of blue. The wind has long since subsided. It is 6.15pm when I reach the top of Drochaid an Tuill Easach. I pause. 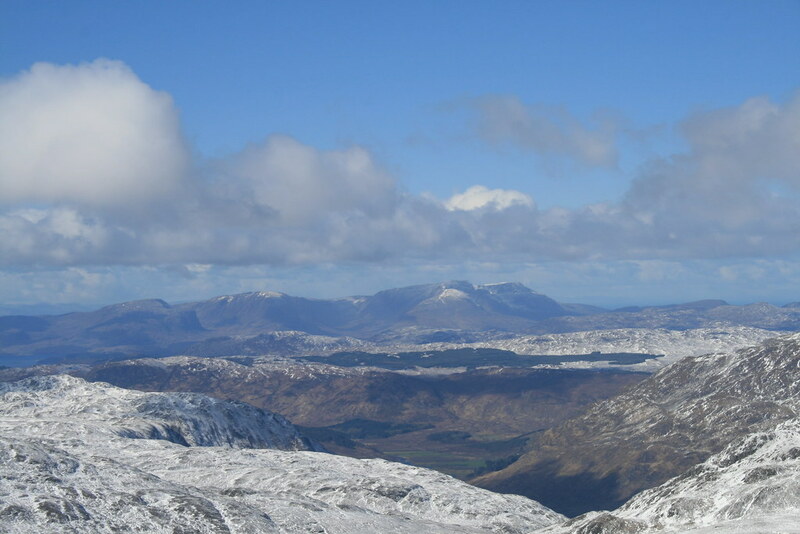 Ben Nevis is now clear miles to the south. I take final glances to the east. 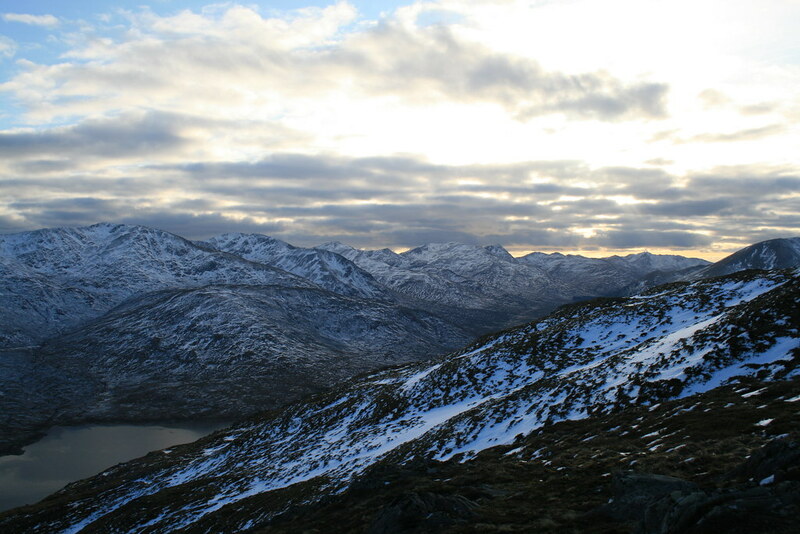 before turning south towards Loch Cluanie. There is a smattering of a path high up. 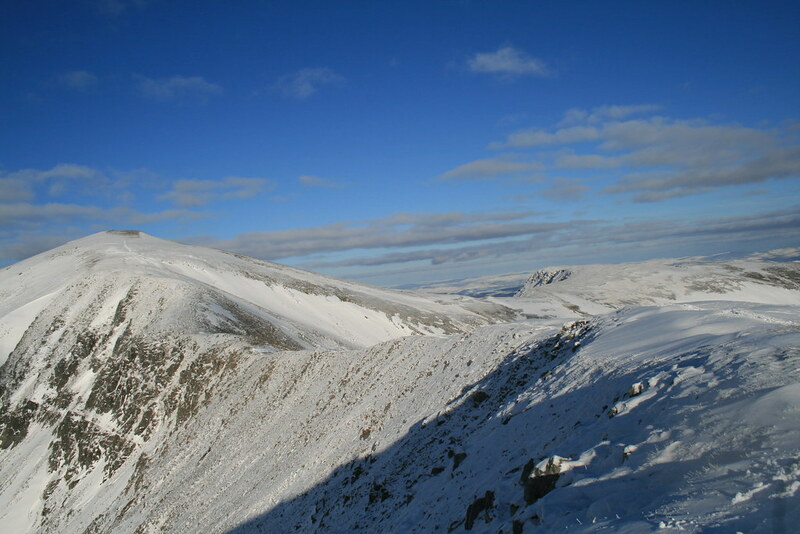 A prominent cairn at the edge of the steepening promises a decent path down. 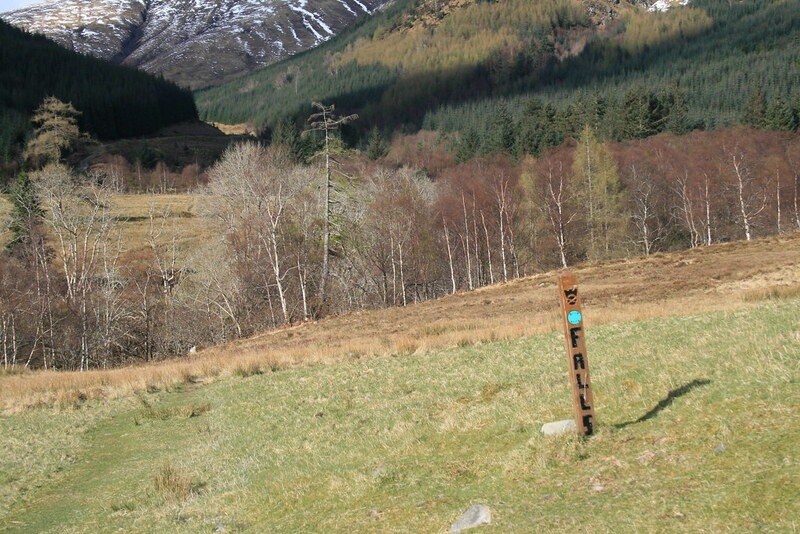 But the trail is a peaty bogfest – how disappointing. I am down to the road at 7.45pm. I decide to follow the road rather than the military road because of a chance of a lift and the fact that there is firmness under foot. No luck with the lift, but Lundie is only two kilometres away and I am back at the car by 8.15pm. A late start at 10.30am followed a latish arrival the previous evening at the Kintail Lodge Hotel in the footsteps of the WH meet. 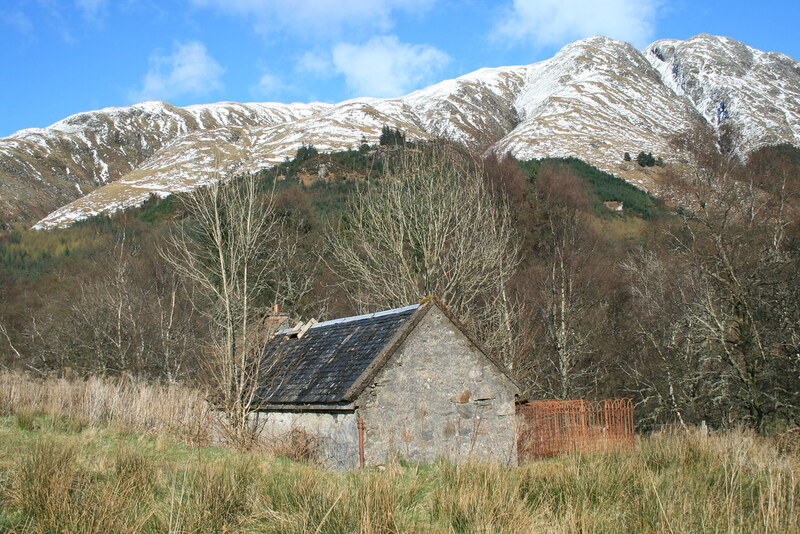 I parked up outside the Kintail Outdoor Centre. 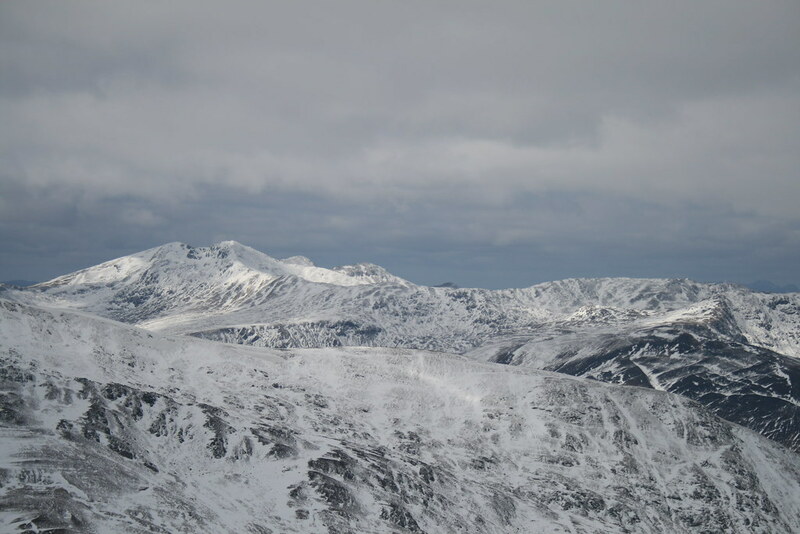 The previous evening had seen a turn in the weather and a dump of snow that had turned the mountains from Spring green back to white to quite low levels. The wind was brisk and chill and snow flurries blew by as I started off. Yet the weather omens were promising. 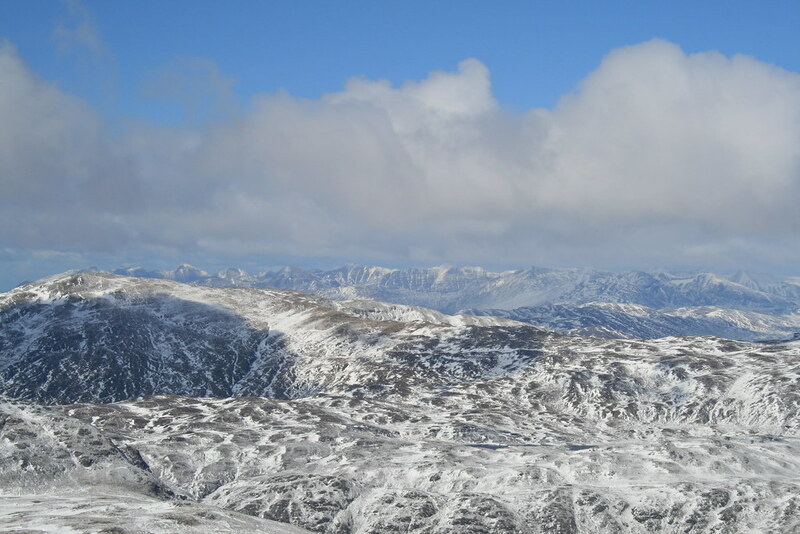 Although the cloud was still sitting on top of the higher hills, there were patches of blue sky – including around the target for today. From the turning area at the end of the public road beyond the Centre a bridge is crossed and a sign soon directs you through the settlement of Inchnacroe on a clear path that leads in half a kilometre to the banks of the Abhainn Chonaig. You are on the path to the Falls of Glomach. There then followed a pleasant walk through woodland and on to open hillside beyond. The views also began to open out behind me. In a couple of kilometres the path splits. 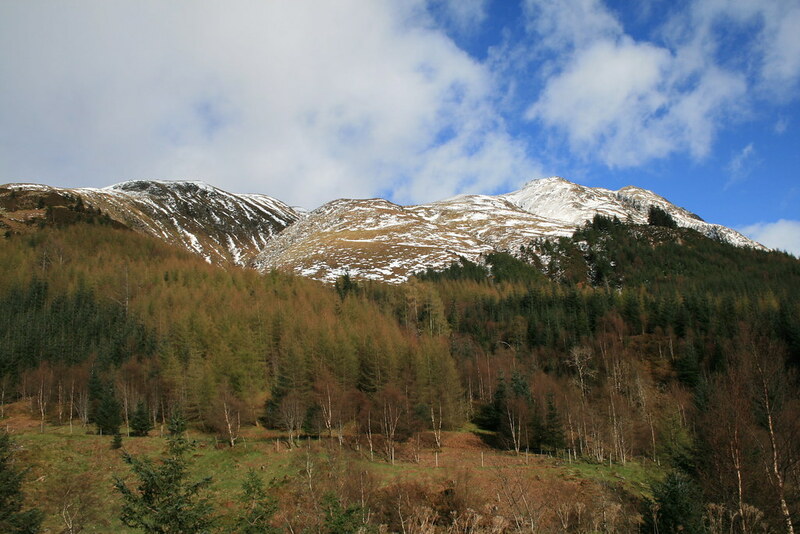 Once upon a time before it was sold by Forest Enterprise into private ownership, it was possible to drive into the Dorusduain forest to a car park saving about four kilometres walk when tackling either A’Ghlas-bheinn or Beinn Fhada. The “P” is still shown on some maps but access is now denied. To the left is the path to the Falls. 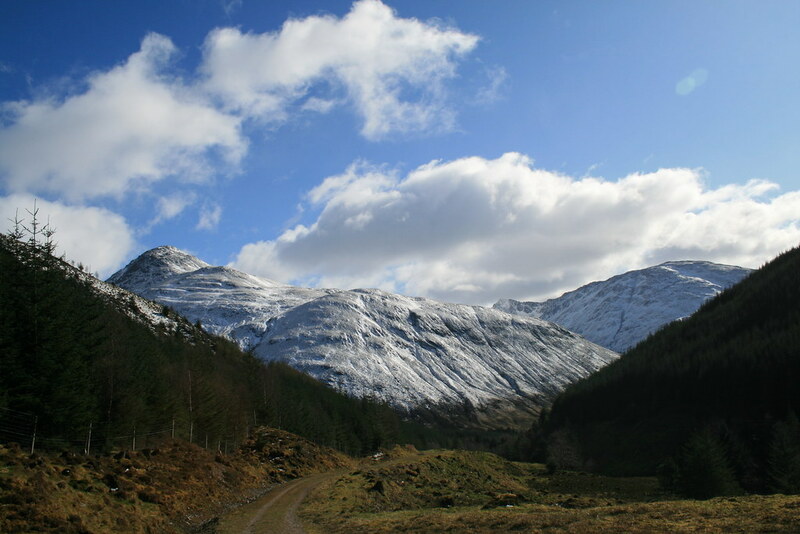 To the right the path goes on to Gleann Choinneachain and then to the Bealach an Sgairne, the Gates of Affric. 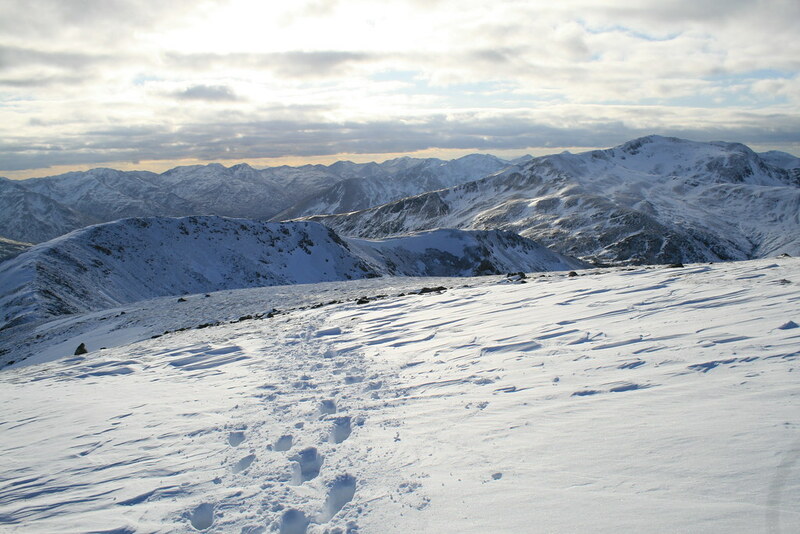 This, of course, is a common route up Beinn Fhada and separately a couple and a chap were heading that way. Shortly beyond that sign there is a gate in a fence and you now feel as though you are starting to climb. Despite the snowfall the path was still clear as it wriggled up through the white coated heather. The path is well constructed and at a pleasing gradient making for swift progress. At about the 200m mark there was a further fence with a gate across the path. At this point the transformation in the path was remarkable. It was as if someone had carefully swept away the snow to that point but had then given up. The path was obliterated. Its line could be followed where it appeared from under the drifts. 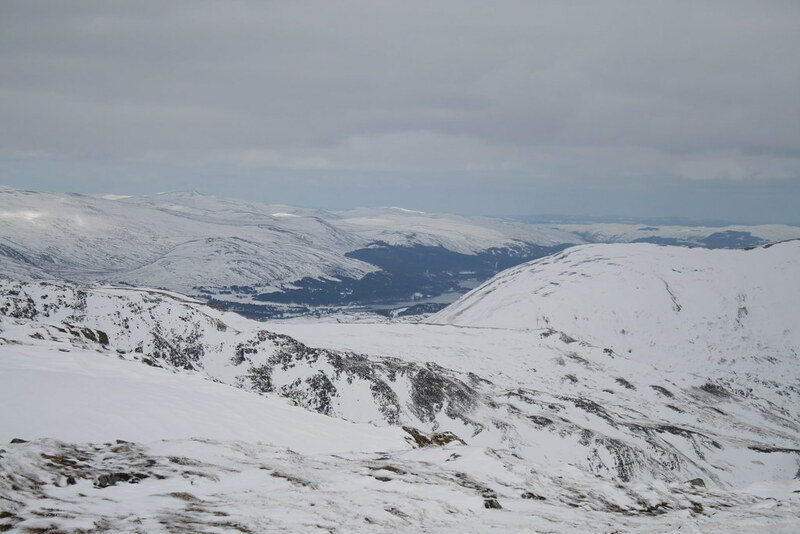 Even though the sun made its appearance from time to time, the air in the glen was chilly. Plumes of spindrift rose driven up and around by the stiff north easterly wind causing the snowdrifts on the route I was taking. 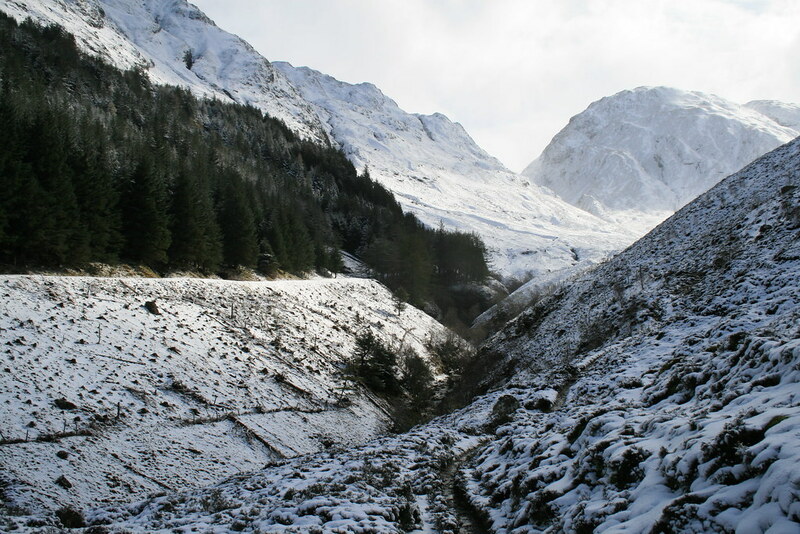 The way alternated between knee deep drifts, teetering on the firmer edge of the path and the softer heather. Occasionally holes hidden under the carpet of snow sent me flying forward with curses. 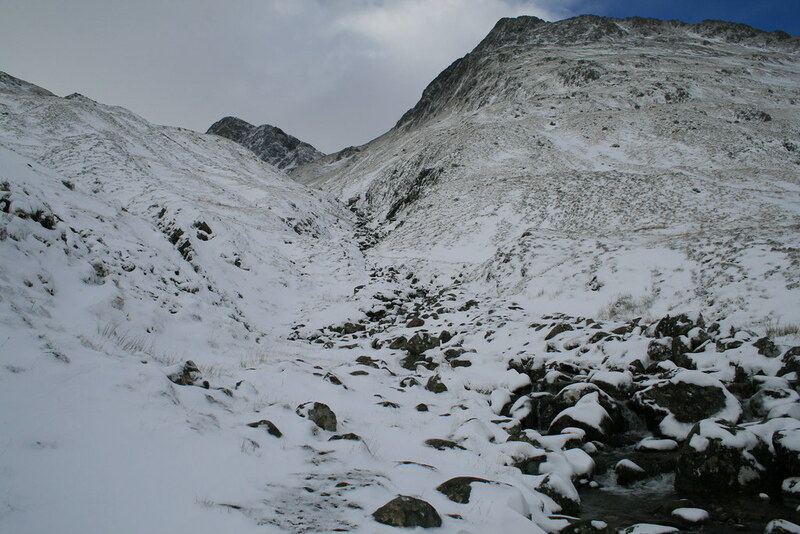 In time I reached the crossing of the Allt Coire an Sgairne. It is interesting to compare the next photo with the third photo in Monty’s report of his walk a couple of days earlier which was taken nearby. I stopped for some food and drink and the single chap passed me. 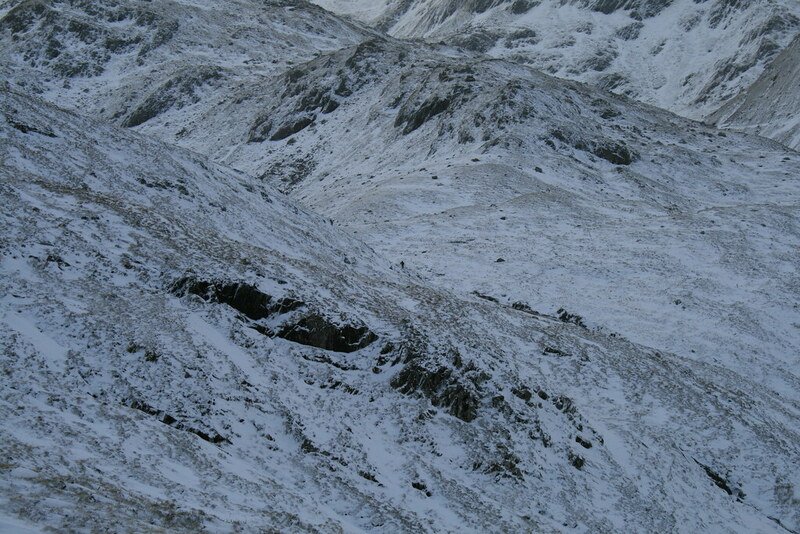 He soon left the route of the path to take a direct line up the corrie. Meanwhile I continued towards the pass. I lost the path completely for a while. Its route re-appeared occasionally once the glen narrowed in its final approach to the Gates. Meanwhile the lone walker became subsumed into the vastness of the landscape surrounding him. The Glen narrowed significantly. 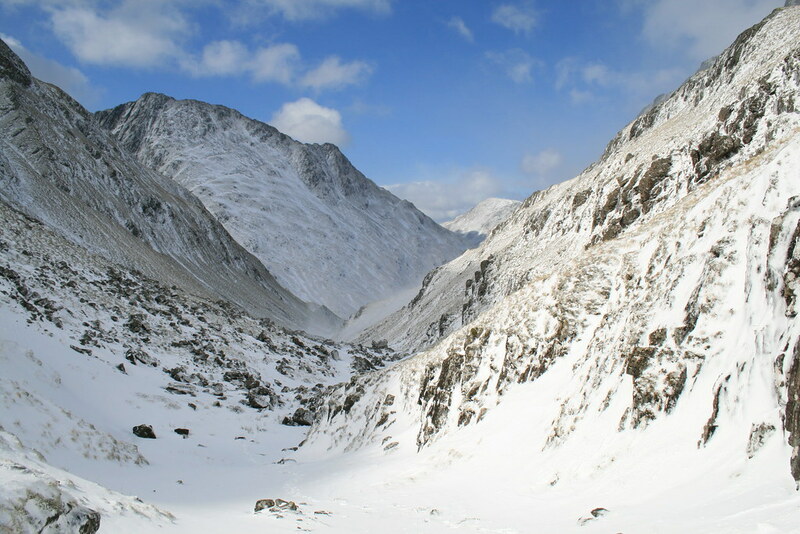 From there, what should have been a 10 minute walk to the top of the pass became a 40 minute battle through thigh deep snow with occasional respite on rocky outcrops. Of course, I had miscalculated. 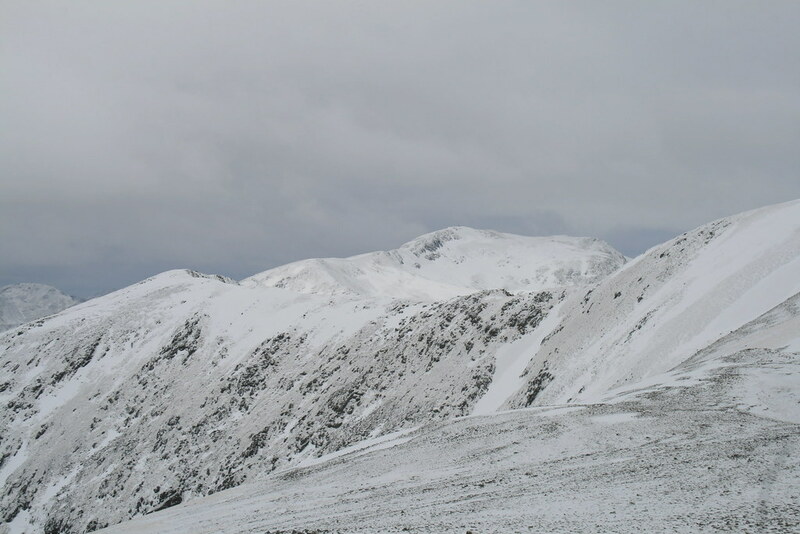 That north easterly wind was carrying the Affric snow through the defile and depositing soft powder on the more sheltered slopes. I am not shamed to admit that it was sometimes faster to crawl on all fours – not a technique that I have often been known to use. But eventually I did make it to the Gates and received a face full of flying snow and a slightly gloomy outlook. 500m altitude and 2 hours 40 minutes after I had set out. I reckoned that St Duthac probably never had these problems. 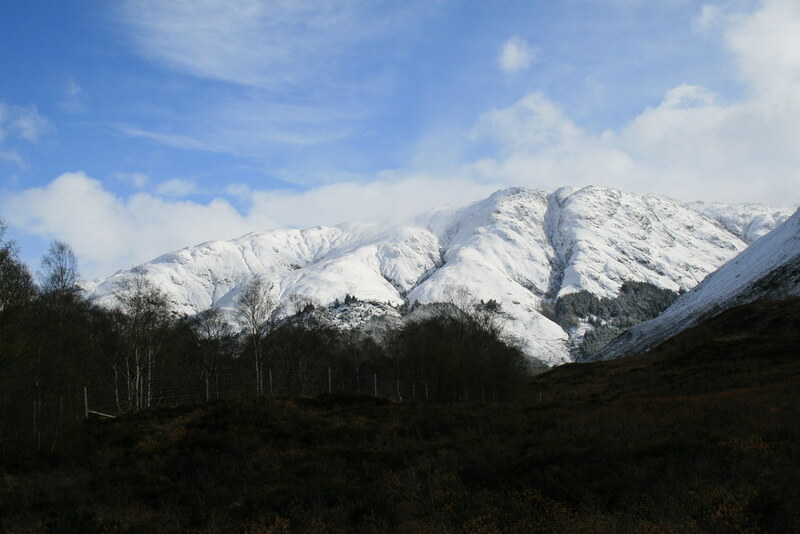 Kilduich, located at the northern end of the causeway at the head of Loch Duich is associated with him. 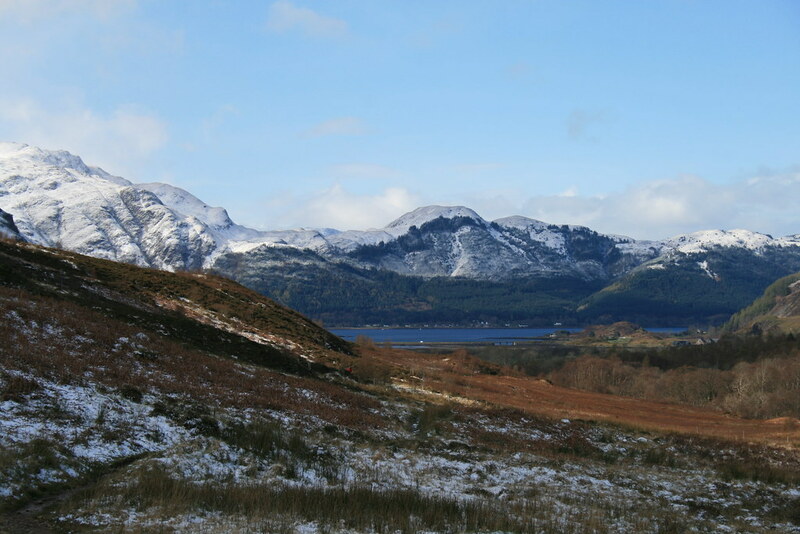 And Loch Duich is Loch Dubhthaic in Gaelic (Duthac’s Loch). He probably passed this way on his journeys between Tain and Ireland. The Catholic church in nearby Dornie is St Duthac’s. 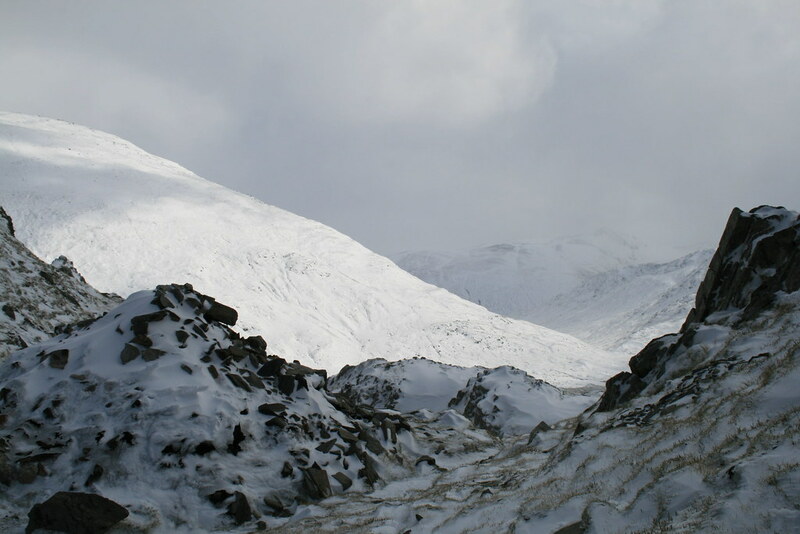 Here a path leads onwards and upwards towards the rough southern ridge of A’Ghlas-bheinn. Again the path came and went. Now, however, the battle was with the wind. At times I just had to stop and brace myself until it relented. Any difficulties with the cliffs ahead were circumvented by turning them to the right (east). The terrain became easier. As I got higher the wind eased. 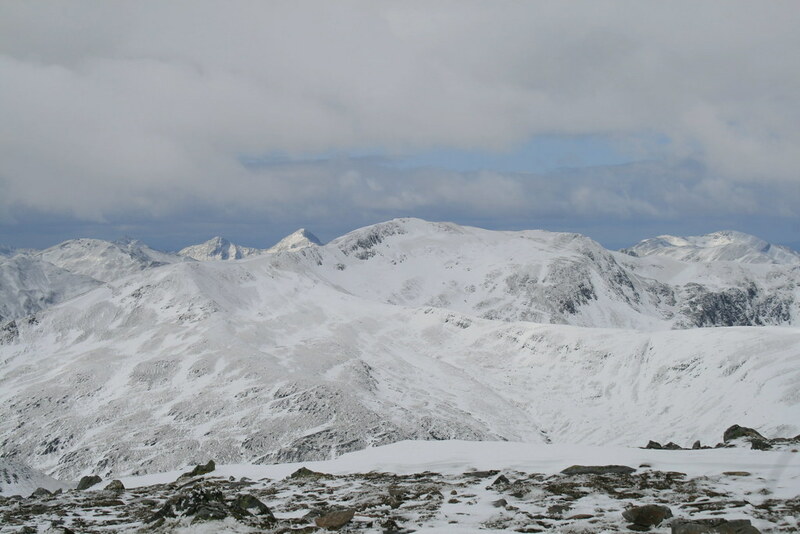 And the views opened out to Beinn Fhada. 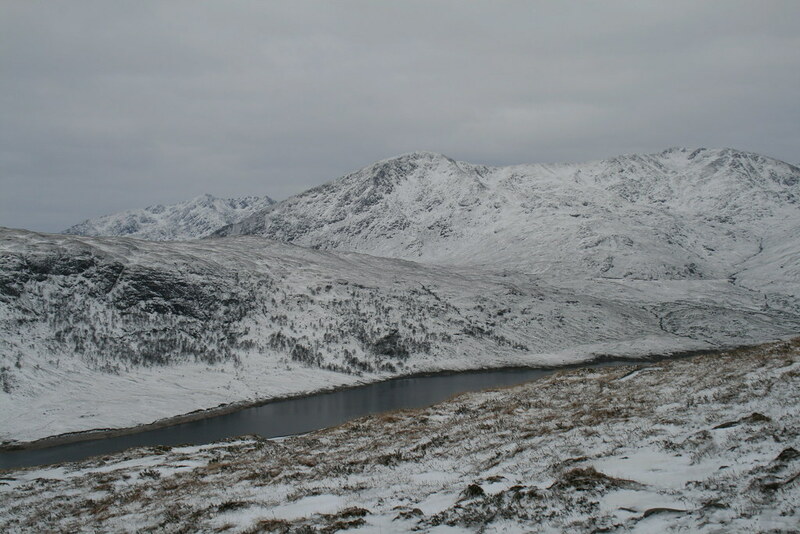 Sgurr Gaorsaic and Loch a’Bhealaich. 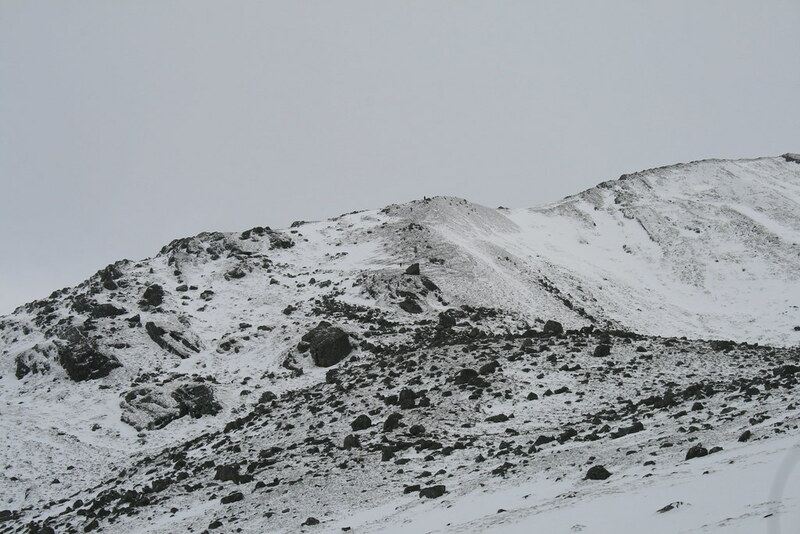 This hill is one of many false summits, but eventually I reached the top at 2.15pm – almost 4 hours after setting off. But it was worth it. The cloud was lifting further, and breaking. I managed to find a sheltered spot a few feet beneath the summit cairn for a rather late lunch. Mini tornados sprung up around me and from time to time I was showered by fine flakes of snow – it was quite refreshing. What a perch I had – views all around. Breaking trail had been hard but well, see for yourself…. I revelled in it. I had this spot all to myself. There was no-one there to share the experience. Sometimes that is a shame but today I was greedy. I wanted this experience to myself. I felt that I had earned it. No-one was nearby. For all I knew the nearest people to me were on Fhada. After almost an hour on the top, I knew that I had to tear myself away. I also knew that I was not going to return the way I had come up. So I headed northwest. I was going to aim for the point where the path to the Falls of Glomach exited the forest. 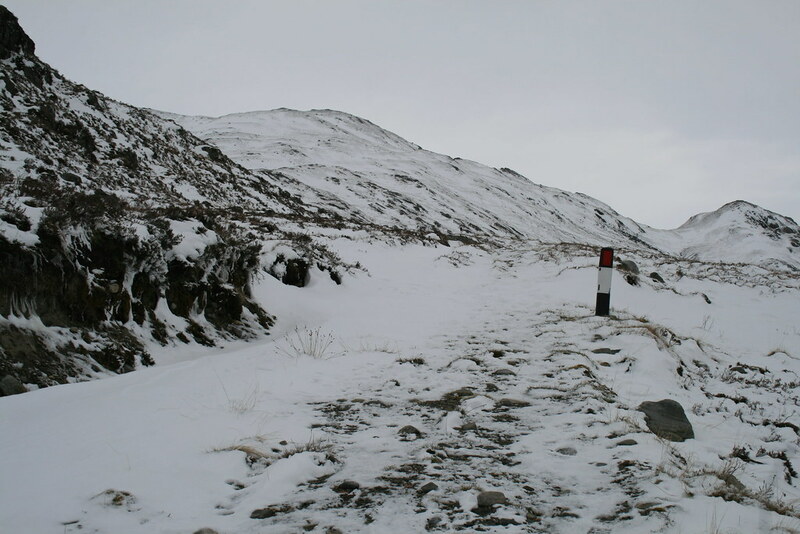 Until the final kilometre down to the path the slopes were gentle and most deep snow was avoidable. The final drop to the path was steep and what snow there was tended to slough off from the grass underneath, which was awkward. But it was a good way down I felt. In the glen I shed a couple of layers. The wind had died down and it was a bit of a suntrap. 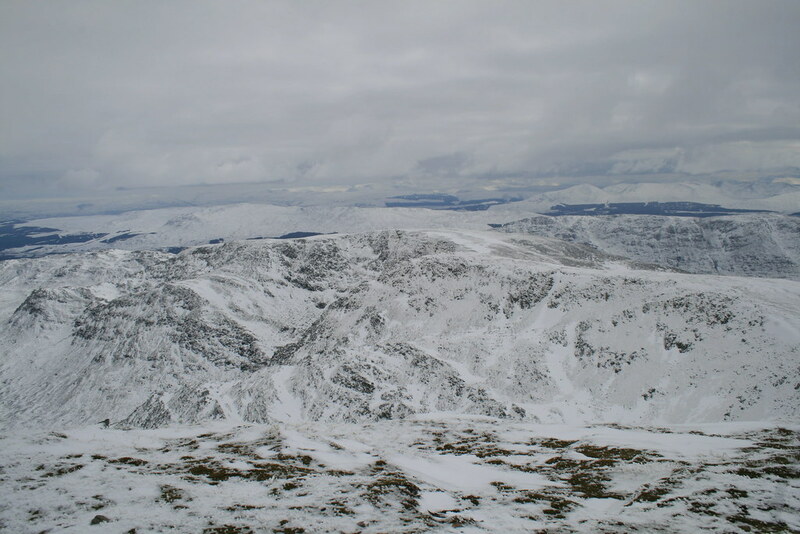 The northwest end of Beinn Fhada and the western flanks of A’Ghlas-bheinn now towered above. And it was good to have the firmer track beneath my soles. A left branch in the track was taken before it went into the forest followed shortly after by a path through a gate into fields passed sorry abandoned Dorusduain. 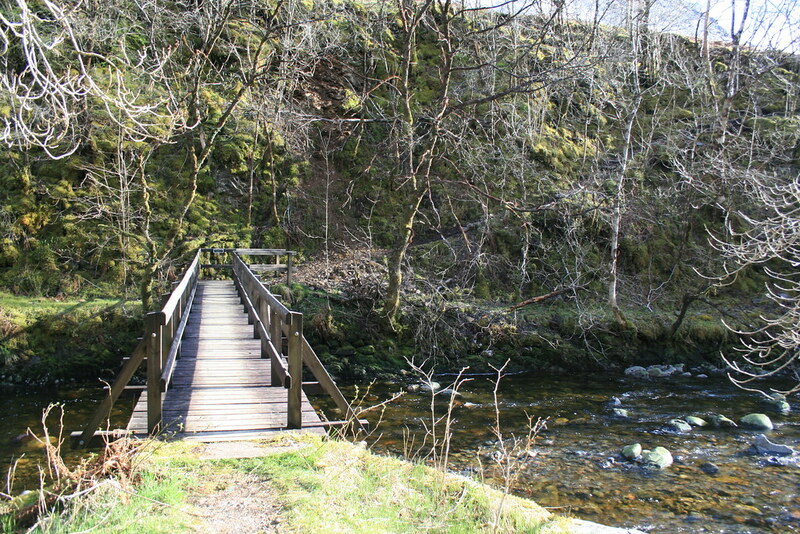 The footbridge across the river is hidden from view but access is via an obvious gate above. As short rise took me back to the sign shown in the third photo and from there the path led back to the day’s starting point.